On a rainy late Monday summer evening in between thunderstorms, we stopped in to try WOW BBQ restaurant. This is the brick and mortar Malden location of the popular food truck that has been making the rounds in Boston for over a year. The new location has been open for 2 months now. 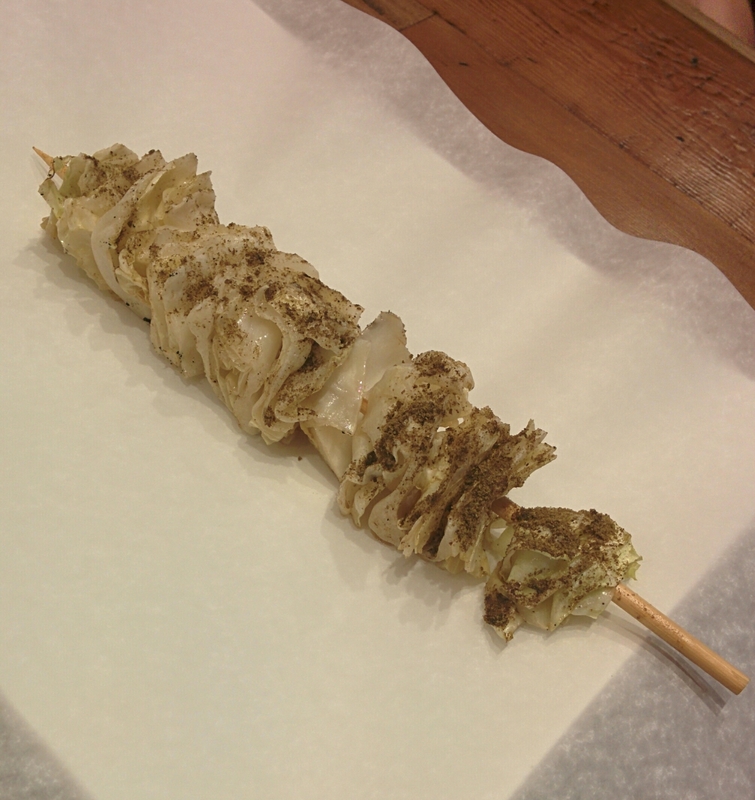 WOW BBQ specializes in chuan’r, a type of charcoal-grilled kebab from Xinjiang, a northwest region of mainland China. The most popular kind is yang rou chuan’r, or cumin-spiced lamb skewer. 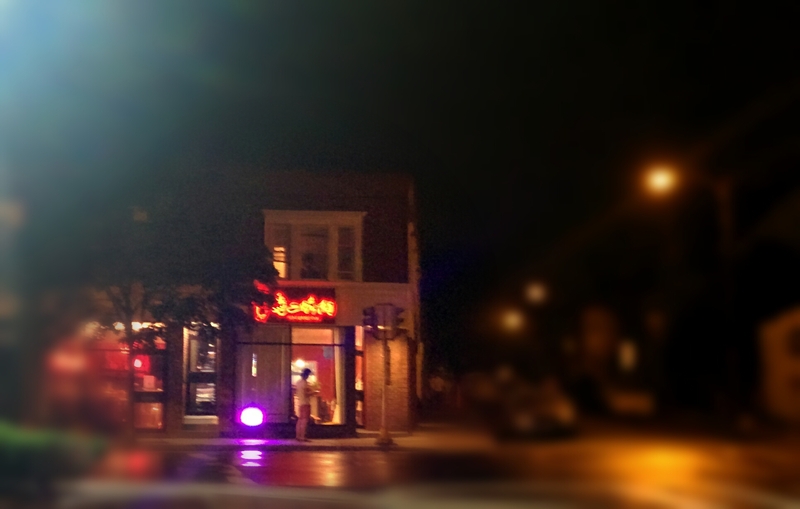 The restaurant is brightly lit with plenty of street parking available. They are open until midnight or later during the week. 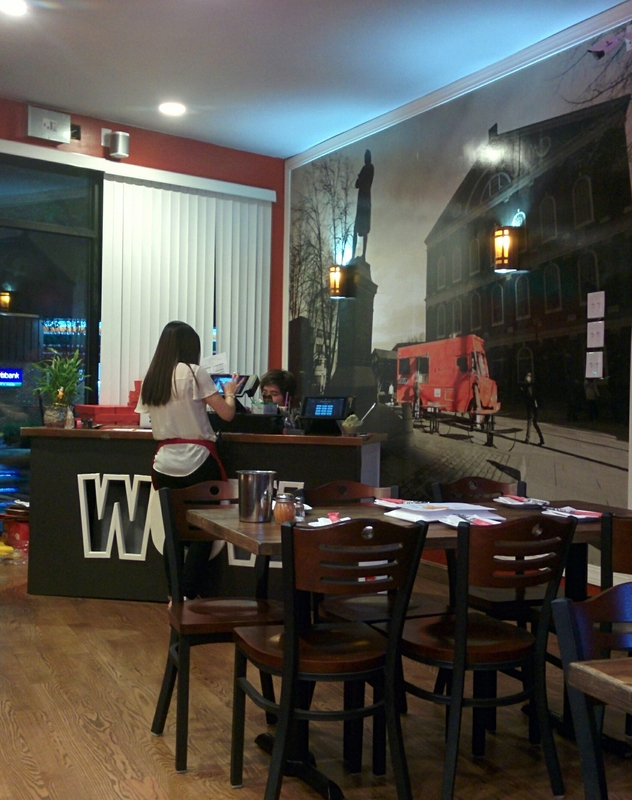 WOW BBQ in Malden is the only chuan’r restaurant that I know is open very late. Other places that serve chuan’r, namely One of The Kind and Gene’s Flatbread Cafe, are not open as late nor do the lamb skewers taste as authentic or good because they are deep-fried (Gene’s are only fried during the week supposedly) not grilled. The inside is freshly painted in red and black with fun, hip graffiti and large wall murals. There’s the main room with two large Samsung flat screen TVs and another room with a bar and another flat screen TV. They are in the process of creating a cocktail menu at this time. WOW BBQ is a good place to watch basketball or soccer games. One thing we also noticed is that they are also very social media savvy and use Facebook, Twitter and Instagram regularly as a large number of their customers are Chinese students. Sandy, our server, was a little stiff at first but perfectly polite. She explained the ordering process and made a few menu suggestions. 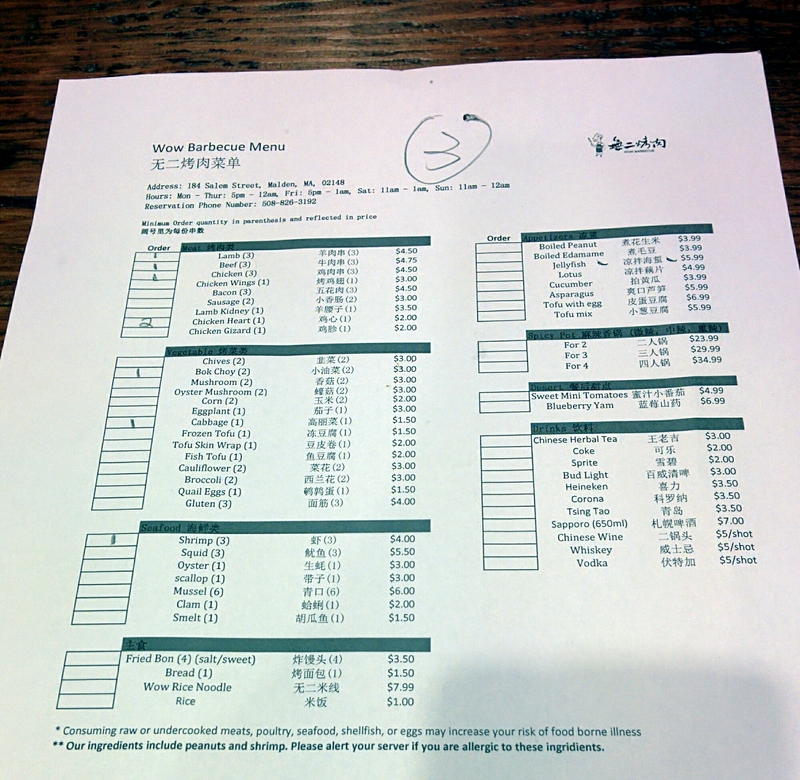 You basically indicate what you want by placing the quantity of each predetermined meat/vegetable/drink next to the appropriate item and the server enters it into the computer system. If you prefer your food with a spicy kick their are containers of ground chili pepper on each table so you can season to your liking. Our server suggested that we try the cabbage and she was right. It was delicious. The cabbage was lightly tangy and covered with a peppery seasoning. The bok choy (top) was good but unfortunately swabbed with a bit too much oil. Next time we would probably request light or no oil on any of the vegetables. 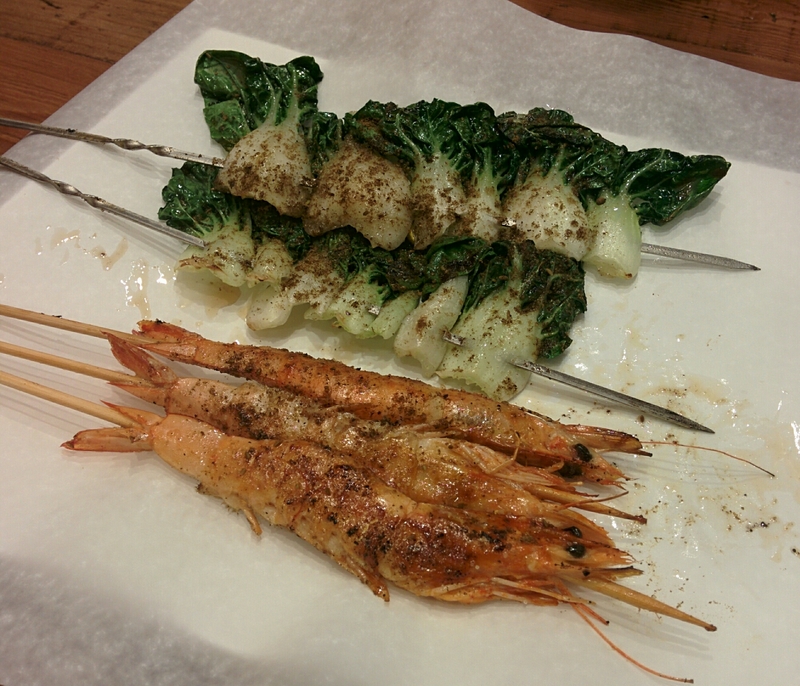 The whole shrimp (bottom) were very tasty and perfectly grilled. I am always happy when my shrimp come with the head-on. That’s the best way to eat them because you get a creamy crunchy contrast. 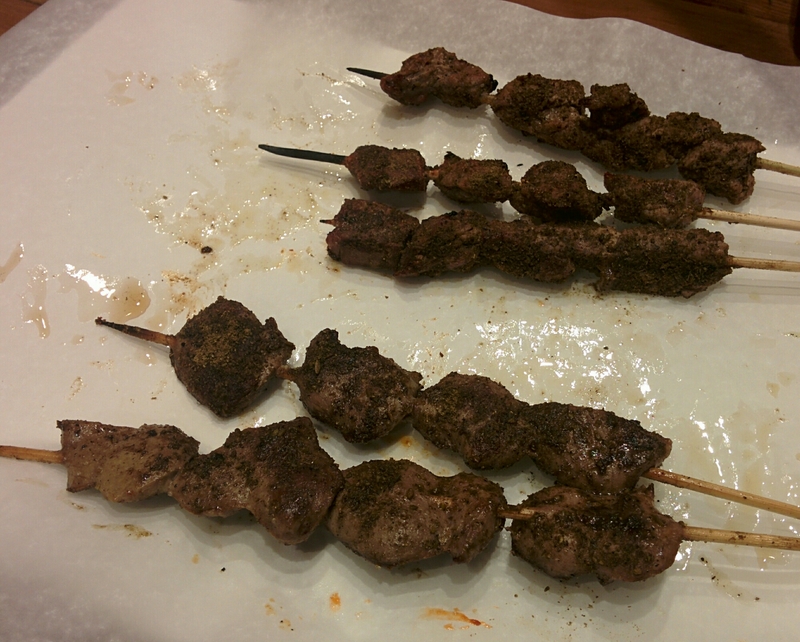 The beef skewers (top) were cooked to well done and turned too dry. Be sure to specify medium or medium rare so the meat stays tender. The seasoning was good. We tried the chicken hearts (bottom) as we do love offal. The hearts were split into half, like little filets, before being threaded on the skewer. They were the right kind of chewy meaty muscle. 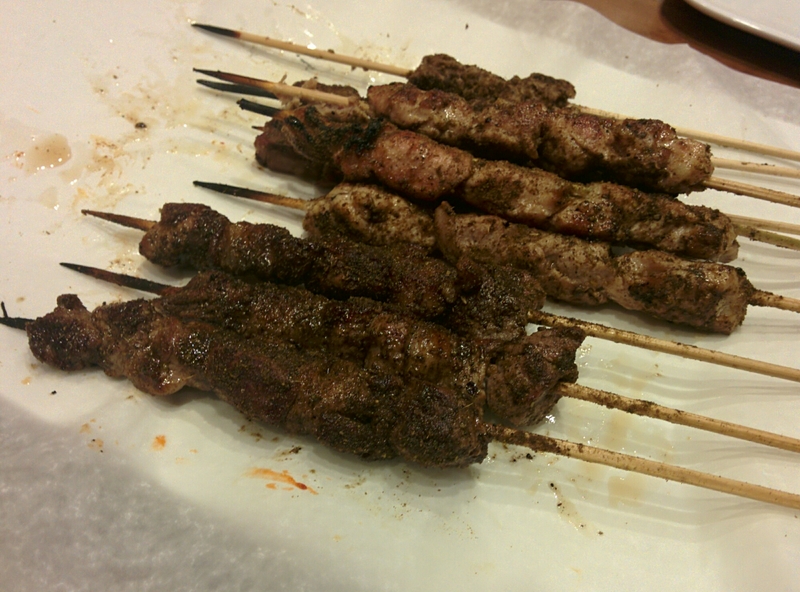 The chicken skewers (top) were delicious because they were tender and well-seasoned. Very more-ish. They were my dining companion’s favorite of the evening. The lamb skewers (bottom) were my favorite. The heavy cumin seasoning was the perfect complement to the lamb. Please note that they each had one piece of fat per skewer to keep the lamb meat from drying out while being cooked. 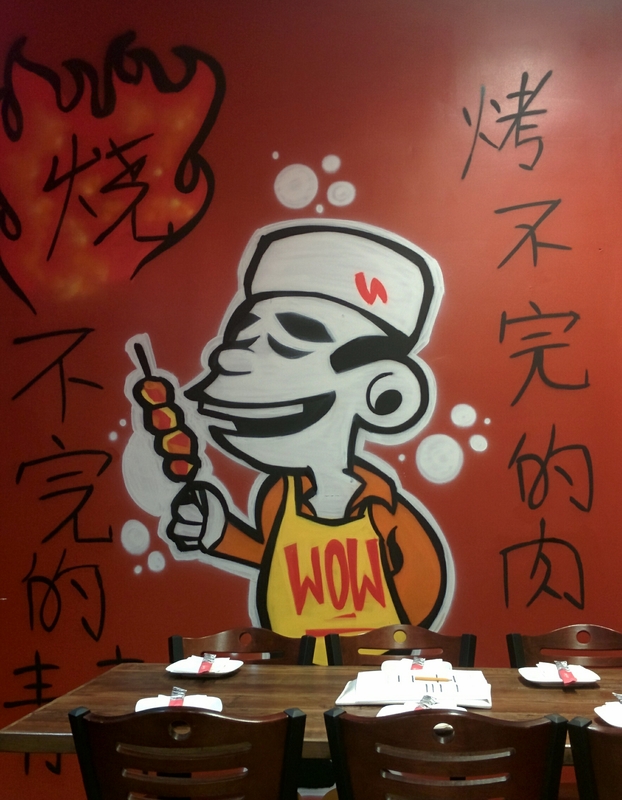 We highly recommend WOW BBQ Restaurant for their excellent chuan’r. If you’re a first timer, try the lamb, chicken, shrimp or cabbage skewers. We also suggest checking out their website or Twitter for weekly specials, because sometimes they offer small discounts. We wish WOW BBQ much continued success!